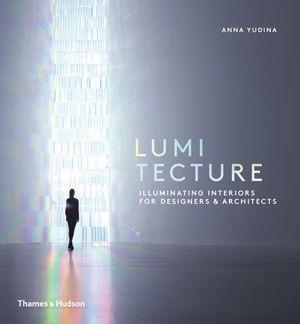 Liz West has works in the forthcoming Thames & Hudson publication 'LUMITECHURE Illuminating Interiors for Designers & Architects' by Anna Yudina. The book will be released in hardcover on the 29th February 2016. "The role of light in architecture extends well beyond practical requirements. Light can create an environment, saturate a space with emotion, and compose spatial illusions. When manipulated in the right ways, light makes an architectural space livable, shapes it, and guides the inhabitant through it. As our homes and buildings become increasingly interactive and connected to the “internet of things” (where physical objects such as a lamp or microwave are programmed in the “cloud”), the creative possibilities for lighting are growing exponentially. This timely publication captures the most imaginative ideas for the use of light in homes and buildings. Some 200 projects are organized into three sections: lighting that transforms space, lighting that alters the experience of time, and lighting that evokes emotion or psychological change. Projects range from design solutions— practical applications and techniques for improving the ambience and function of our spaces for living and working—to highly experimental or immersive experiences that induce physiological responses or use entirely new sources of light, such as bioluminescence or rarefied gasses."